Food is served daily from 10.30 am. Seafood is our specialty. 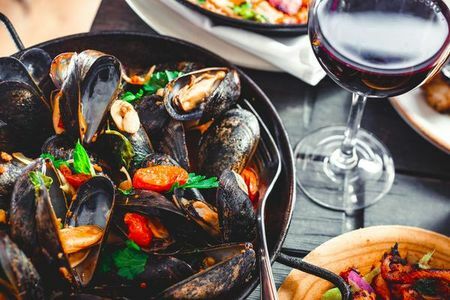 Our restaurant has a well-earned reputation for its fine cuisine, specialising in the daily catch of local Seafood and the best Connemara hill lamb, as well as delicious local Irish Beef. We use only the freshest ingredients and all meals on our menu are prepared to order. We serve the best of local produce from land and sea in a beautiful setting. Keogh’s Bar is synonymous with the words good & fun, so saying that our bar has an atmosphere of good fun is easy to do. The Guinness is good, the craic flows, and you can while away an evening chatting with friends or making new ones, as the bar is also the ‘local’. There is no finer spot to leisurely while away those fragrant summer days, whether sightseeing, walking, or golfing … and of course the nights are well catered for also. 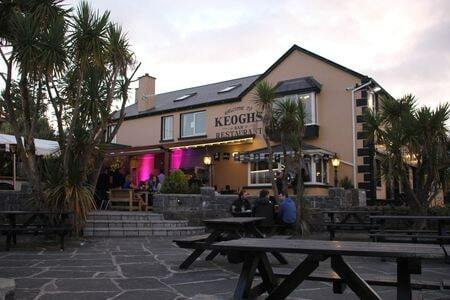 Keogh’s Pub is a traditional community pub, right at the heart of the local community. The pub has all types of events on throughout the week, from darts league to card games. Keep up to date with our Facebook page. We show all major sporting events. Our beer garden affords great views of the 12 Bens, and Roundstone Hill, and there you can enjoy a nice drink in a family friendly environment. Entertainment is provided at the weekends. On Sunday there is a late bar. The Off licence next door is famous for its extensive range of fine wines. All major credit cards accepted. Facilities for the disabled. Family friendly premises.